Dimensions 1.15 by 6.69 by 9.61 in. IN the trilogy "With Fire and Sword," "The Deluge," and "Pan Michael," Sienkiewicz has given pictures of a great and decisive epoch in modern history. The results of the struggle begun under Bogdan Hmelnitski have been felt for more than two centuries, and they are growing daily in importance. The Russia which rose out of that struggle has become a power not only of European but of world-wide significance, and, to all human seeming, she is yet in an early stage of her career. In "Quo Vadis" the author gives us pictures of opening scenes in the conflict of moral ideas with the Roman Empire,Ã¢ÂÂa conflict from which Christianity issued as the leading force in history. 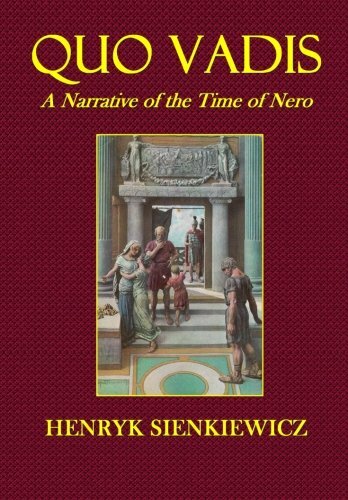 The conflict described in "Quo Vadis" is of supreme interest to a vast number of persons reading English; and this book will rouse, I think, more attention at first than anything written by Sienkiewicz hitherto.